Edraw Max is a quick and easy tool to create funnel charts exactly as you need in minutes from examples and templates. 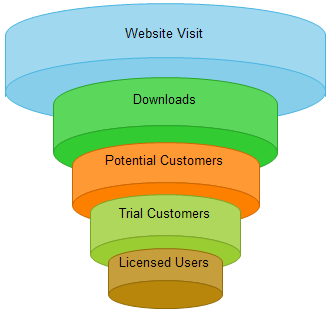 Funnel chart is extensively used to represent stages in a sales process and show the amount of potential revenue for each stage. This type of chart can also be useful to identify progressive reduction of data as it passes from one phase to another. 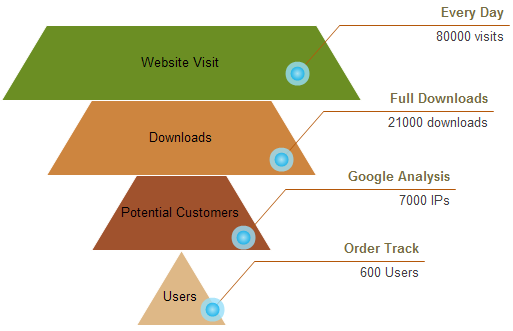 The following figure is a simple funnel chart template which indicates that some quantity declines from a large number to a small number. For instance, starting with website visits, only a fraction of which result in downloads, and only a fraction of those result in inquiries about potential customers and sales, etc. 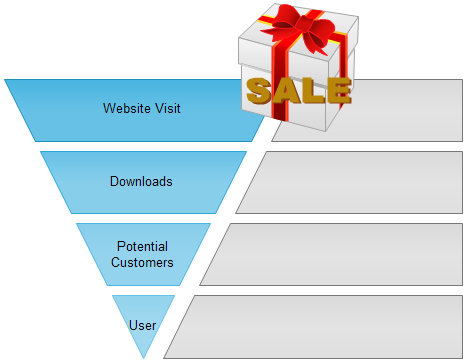 The following figure is a 3D style sales funnel chart template. The size of the area is determined by the series value as a percentage of the total of all values. The following blank funnel chart templates are some pre-defined symbols in the Pyramid Chart library.